Description : Besides, we ensure to make prompt delivery of the ordered products at the clients' end with our strong logistics support. we are offering wide range of Red Party Hall Tent. 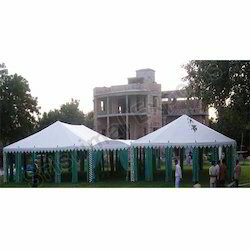 Our Clients can avail from us quality Decorative Dinner Tent. These are very popular among our clients due to its attractive designs & elegance look. Inner Colour –Red, Blue, Yellow, Royal Blue, Jaipur Pink, Jodhpur Pink , Orange, Firoza Blue, Black, White, Batch Colour, Pinch Colour, Mint colour, Mountain Green, Royal Green. Being one of the trusted firms in the industry, we are highly engaged in providing a unique range of Luxury Party Tent. We are renowned manufacturer, supplier and exporter of the best Luxury Party Tent in the market. Products we offer are tailored using high grade fabric and machines of advanced technology at the well segregated production premise of our organization. These are tailored as per the latest fashion trends in the era. 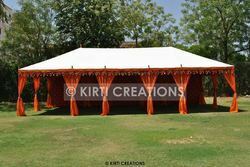 Avail from us a diverse range of party tents. We offer Beautiful & hand crafted Square Size PergolaTent) in different size i.e. 3x3 , 4x4 meter etc. Utilization:In Garden Party, Small Gathering, In Resort, Hotel as Bar Tent etc. Can be manufactured any custom size and design. Description : We use the high quality products in making of Lavish Party tent which is sturdy and spacious. It is designed in hut shaped and open from all sides. Its orange and cream color combination of canvas enhances the beauty.